You may think of negativity as being low vibrational thoughts, “bad” thoughts, or even as thoughts that fill you with sadness, disappointment or anger. 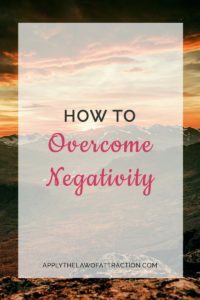 But to really understand how to overcome negativity, you have to know what negativity really means. Merriam-Webster defines negativity as “marked by denial, prohibition, or refusal.” Tracing the word back through history to its Latin roots in the word negativus, negativity becomes a word which over the centuries has meant absence, nonexistence, and that which denies. It's here that you can see the full impact negative thinking has on the Law of Attraction. Because your thoughts have the power to create, with each negative thought, you are harnessing the power to deny, to prohibit, to refuse, to create absence, and to end the existence of something. If you are negative, you do not exist. You have no features and no qualities that support what you want. Period. Full Stop. If you are negative, you are ineffective. Good things will not come to you. Ever. If you are negative, you are denying the universal Law of Attraction to work for you. Always. A law is something laid down or set in place. If something exists, it must be so. If it exists, it is somewhere. It has features and qualities. It is not negative. If you want to move away from negativity, if you want good things to come to you, or if you want to change your life, then you must follow the laws laid down for attracting what you want. The most basic way to affect the changes is to become positive. When you are positive, there is no question that something will not happen. The law must work because it exists. We are positive it exists. When you argue with yourself or with others that something will not work or it will never happen, well guess what? It won't! You just said it cannot exist. It is negative, void, unavailable to be real. Make it real. Overcome negativity by convincing yourself that it will work and that it will happen. If you always say that the bus will be late, then it will always be late. It cannot arrive on time or early. Those time points do not exist. The only existence is lateness. If you change your thought to a positive one and say that the bus will be early, you have opened the possibility for it to be early. You have told the Law of Attraction to bring into existence at the earlier time point. When you allow yourself to be non-existent by being negative, the Law of Attraction cannot see you or hear you. You don't exist to it. You are nothing. Having confidence in yourself and the Law of Attraction is important. When you are unsure or when you lack trust or when you waver back and forth between maybe it will and maybe it won't, you will not get what you want. The law is there. It does not change. It has not changed IN FOREVER. It is not changing now or in the future. You will get what you want if you have confidence in it happening. If you trust that it has happened and that you are certain of it happening. I recently had a friend interview for a job. Her attitude was wonderful during the initial process. She had three in-person interviews at three different locations for the company. Each interview built on the previous one in terms of the response from the company to her ability to perform the job. Her energy was through the roof! It made me happy just watching her. Each time the company asked her back, she knew the job existed. She was confident she was the right person for the job. She trusted that she would get the job because she wanted it. And then it happened. No more calls. No more communication. The job must not be hers after all. Her energy drained away. Happiness left. Negativity wiped it all out. The job, to her, no longer existed. But, the law must work, right? The Law of Attraction states that if you want it, it will happen. One key thing was not happening for my friend and this may be happening to you. You have to change your thinking and that change must start with an action. The action could be as simple as smiling. Make a happy face! Squint those eyes and curl those lips. It's not easy being negative when you smile. My friend started smiling. She moved on. She called other recruiters and old colleagues to find other jobs. She had phone interviews and set-up time for more in-person interviews. She asked around and looked at press releases to understand what might be happening with the first company where she had interviewed. She found that the company was busy with an acquisition, which was consuming everyone's time. She now had something she could act on. She changed how she thought about the company and the job. A glimmer of positivity crept into the negativity. That little bit of light began to fill the void. It wasn't her. She began to fill the negative with something – hope and want and desire. Six days later, she received a call. The company offered her a job. They wanted her to start within the next two weeks. Oh Yeah! The want was there. The action of wanting filled the non-existence. The law worked. She existed. The job existed. The confidence and surety of the right thing happening brought her and the job together. The law worked. Remain positive that good things happen. Want good things to occur in your life. Trust that what you want will happen. The Law of Attraction works.